More and more people are aware of the importance of staying fit through exercise. However, not everyone has the time to hit the gym and work out. Corporate slaves, entrepreneurs, mothers, and even students have too many things to attend to that they find it hard to find time for exercise. This is why a lot of home gym equipment like the elliptical trainer has become a hit among the general public. With an elliptical trainer, you can spend a few minutes to work out in the comfort of your home. Aside from that, there are other benefits of having an elliptical trainer at home. One is that it offers a low-impact workout that benefits both the lower and upper body. Senior citizens, as well as those with knee or joint problems, can work out on an elliptical trainer. It can reduce stress and strain on the legs, unlike running on pavement. If you are looking for an elliptical trainer that doesn’t take up a lot of space, easy to use, and affordable, then this unit from Stamina should be high on your list. It measures just 24 x 15 x 13 inches, and compared to other elliptical trainers is lightweight at 37 pounds. With its compact design, you can even bring it to your office and use it during your breaks. This foot- pedal- only trainer is designed to work out your lower body while protecting your knees, hips, and ankles. It also has an electronic monitor that can keep track of your strides, the number of calories burned and your exercise time. This machine is sturdy as it is made of steel. It also has non-slip pedals thus you don’t have to worry about getting into an accident when you are on this workout trainer. You can also adjust the resistance levels electronically. However, the fact that this is a foot-pedal-only unit means you won’t be able to work out your arms and the upper body. There are also no handlebars in this unit, which can be an issue if you have poor balance. Some reviewers say that the electronic features aren’t precise. Finally, with its short stride length – this elliptical machine is not suited for tall people because of its short stride length. If you want an elliptical machine that can work out your upper body, then this one is a unit that you must consider getting. Its dual action design works out the arms, giving you the upper body workout you desire. It also comes with an adjustable strap tension and workout computer, as well as an LCD display that shows distance covered, calories burned, and elapsed time. This unit is designed to minimize stress on the joints with its natural elliptical motion. With dimensions of 33 inches in length, 19 inches in width, and 46 inches in height, the elliptical trainer won’t take up as much as a treadmill. It’s a perfect choice for people who live in apartments. Although it is heavy at 57 pounds, the elliptical trainer has transportable wheels on its base so that you can move it from one room to another. For all its features, it is still very cheap. In fact, it is almost the same price as the Stamina In-Motion Elliptical Trainer. But it also has its share of drawbacks. One is that it is quite loud when in operation. Another flaw is that assembly can take a lot of effort, especially if you’re not a handyman. Finally, a lot of users say that this isn’t the smoothest elliptical trainer in the market. If budget isn’t much of a concern, then you must include Schwinn 430 elliptical machine from Schwinn in your list. It’s an elliptical trainer that can rival those you would find in gyms. Getting bored with this trainer is a bit far-fetched as it has 22 programs that can keep you motivated and challenged. With 20 levels of resistance, you can focus on different muscle groups and get the type of work out that could make you sweat a lot. This elliptical machine also features a dual track LCD window system that provides up to 13 display feedbacks. You can also charge your smartphone on this unit with its charging USB port. The mp3 port, meanwhile, lets you play your favorite tunes so that you can stay motivated throughout your workouts.This is a huge piece of equipment, but sturdily built. While you will be paying a lot for this machine, you can be assured of its quality. You can even save details of your workout, allowing you to keep track of your progress, on this machine. It is really an advanced elliptical trainer you often see in fitness centers. Of course, it has its downsides. Because it is huge, it takes up a lot of space in the room. You should at least have a vertical clearance of 8 feet in your room to be able to use it. Set up will also require some help, and you would have to spend at least an hour or so in assembling it. Like the Schwinn elliptical trainer, this one isn’t exactly cheap. But you’re getting your money’s worth as it is a 2-in-1 home gym machine. It not only works as an elliptical trainer but also as an exercise bike. With this trainer, you aren’t the only workout out the arms and legs but also your abs and buttocks. Adjusting the resistance is easy with its tension knob. There’s also an LCD display screen that will show your speed, distance elapsed time, and calories burned. It also has a set of handrails that have built-in pulse rate sensors, with the pulse rate displayed on the LCD screen. It features a foot stride of 11 inches and an arm extension of 21 inches. This exercise machine is strong and sturdy that it can accommodate individuals who weigh as much as 250 pounds. The seat and handles are both height adjustable, while the foot pedals are not only large but textured as well. The major concerns with this unit are the noise that it makes, and the fact that the seat isn’t cushioned at all. This dual cardio workout trainer can be used as an elliptical machine and an exercise bike. It’s a great choice for people who easily get bored with their workouts, or even those who want to lose weight without putting a lot of stress on their joints. One of its attractions is the chain-driven fan that produces a gentle breeze as the user exercises. The wheels run quietly and smoothly, which make it ideal for use in apartments. The seat, meanwhile, can be adjusted vertically and horizontally so users of different weight and height can still use it. You can also adjust the resistance level through a tension knob. The price is another reason that you may likely opt for this unit. 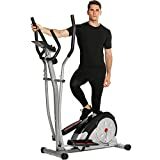 Compared to the other two-in-one workout machines mentioned in this article, this Body Rider elliptical trainer is very cheap. But not everyone is a fan of this workout machine. Many reviewers say that they are disappointed that the frame tends to be wobbly. Others complain that it can take several hours to assemble this elliptical trainer slash exercise bike. This elliptical trainer is a good choice for people who are looking for a sturdy workout machine without paying a lot. It is also quite compact and lightweight for its class. This elliptical trainer can give you the low-impact cardio workout from the comfort of home. It has large, anti-slip platforms that ensure the stability of the machine. Its magnetic resistance system, meanwhile, ensures the smooth motion of the exerciser. With its static, hand pulse monitoring system, the Sunny Magnetic elliptical trainer can take heart rate readings while you work out. The unit itself has a computer that can provide work out details like speed, distance, calories burned, and time, among others. Compared to other elliptical trainers, this one is pretty compact with measurements of 37.8 inches by 26.6 inches and 60 inches (length x width x height). It weighs around 68 pounds. While the price of this elliptical trainer certainly makes it an attractive choice, this is far from being perfect. Aside from being a bit noisy when in operation, this elliptical trainer is also very difficult to assemble. Its stride is also short, although that is understandable given the length of the unit. Arguably the biggest selling point of this elliptical trainer is its Mobile App tracking feature. With its Bluetooth technology, you can use your iPhone or iPad to track workout results anywhere and anytime. There’s also a special storage space on the unit for the iPad, allowing you to watch movies and listen to music while you exercise. There are 12 programmable workout memory slots in this unit, and the display shows you vital workout information such as distance traveled, time elapsed, heart rate, and more. You can also choose from the seven preset workout programs if you want to add more variety to your workouts. It also has a double belt and drives system that facilitates smooth and quiet operation. There are wheels on the base of the elliptical machine so you can move it easily. This isn’t really a cheap workout machine but that’s understandable because of the features integrated with this unit. A lot of reviewers speak highly of this unit. The few disappointed reviewers, however, say assembly is quite difficult. Others complain that the elliptical trainer is noisy. The Schwinn 470 is very similar to the 430, although it has several differences. One is that it has more workout programs (29) compared to the 430. It also has more resistance levels (25) than the 430. Like the Schwinn 430, this unit boasts of two LCD window system where you can see 13 different display feedbacks. It is a great way to keep you motivated throughout your workouts. You also can choose from four user settings on this elliptical trainer. With a 20-inch stride length, this elliptical trainer is ideal for the big guys. The footplates also have to cushion so that users will be comfortable all throughout, while further minimizing the stress on the feet and knees. If you’re to buy this machine, you won’t likely get bored using it. There are acoustic chamber speakers that can blast your favorite tunes. And its angled moving handlebars should give your hands the most comfortable position. The static handlebars can also detect heart rate, which is then displayed on the LCD screen. Aside from being big and thus consuming a lot of space in the room, the Schwinn 470 also has a very prohibitive price tag. This is a mid-range elliptical trainer that can be a good alternative to the Schwinn 470 and other expensive workout machines. You can choose from 16 workout programs in this unit. It is very easy to use, as you simply have to press the start program and the unit would begin to move. With its 16 resistance levels, you can take your workout to the extreme on this machine. It can also double as a cardio recumbent bike. To make things more interesting, you can plug in your mp3 player and listen to your favorite tunes. And unlike the Schwinn 470 which takes up a lot of space in the room, the ProForm Hybrid Trainer is relatively compact. Plus it has a 350-pound user weight capacity, which is one of the best in its class. The price is also very attractive as it is a few hundred dollars cheaper than the high-end units on this list. The stride length of the Hybrid Trainer is just 15 inches, which is a bit disappointing. Others say that they find the elliptical machine a bit noisy. Other than those flaws, this is really a good choice if you are hesitant to buy a high-end elliptical trainer. Similar to the ProForm Hybrid Trainer, the E35 is a mid-range elliptical trainer that packs solid features but in a more budget-friendly price tag. Its drive system works in both forward and backward directions. Many reviewers say that the elliptical trainer is very quiet in operation. Its moving handlebars are adjustable, with pulse sensors for heart rate monitoring. This elliptical trainer also has oversized foot pedals that are comfortable and can minimize stress on the ankles and knees. Plus, you won’t get bored while working out as there are built-in speakers that can play your favorite tunes anytime. You can also keep track of your workout as the elliptical trainer will show essential training data, from the time elapsed, distance covered, among others. Other nice features are water bottle holder and a built-in cooling fan. Many reviewers are in awe of this machine and its numerous features. They also love that it is reasonably priced. Not everyone, however, will have the capacity to assemble it. In fact, there are reviewers who said they even had to enlist professional help to put the elliptical trainer together. This is not surprising as the package contains 175 pieces, which can be very overwhelming for any individual. Elliptical trainers have variations in stride lengths- 16 inches, 18 inches, 20 inches, 22 inches, and so on. But what is the right stride length for you? It depends on your height. If you are 5 foot 3 inches or shorter, you should look for a unit with a stride length of 16-18 inches. If you’re 6 feet tall, the elliptical trainer you should buy has a stride length of at least 20 inches. Buying an elliptical trainer with the right stride length can go a long way towards ensuring that you can work out longer in the elliptical trainer. If you use an elliptical trainer that is too short for you, you would likely feel cramped after a few minutes. Another critical factor in shopping for an elliptical trainer is the stability of the unit. You must look for an elliptical trainer with a stable and solid feel. Although one can’t blame you for considering a cheap elliptical, you don’t want to get a unit that is lightweight and unstable. It is also a bit dangerous to work out on a trainer that is lightweight if you’re a bit on the heavy side. You should also consider the reputation of the elliptical trainer manufacturer. Naturally, the reputable companies are more likely to have elliptical trainers that are stable and sturdy. Their products are also more likely to last for a long time. More often than not, reputable companies provide solid customer service. They will honor product warranties, and attend to your queries in case you find something defective in your purchase. Depending on the price of the unit, elliptical trainers may offer basic or advanced features. One feature you would want in a trainer is the adjustable recline, as it can allow the machine to focus on different muscle groups. Moreover, it would add variety to your workouts and make the machine less boring to use in the long run. Another feature you should look for is adjustable resistance. This lets you increase the intensity of your workouts, depending on your needs. Other features you may desire are customizable workout programs and heart rate tracking. How To Use Elliptical Machine? The 10 aforementioned elliptical trainers are great choices given their features, price, build quality and stride length. I have also listed the workout machines taking into consideration the different types of elliptical trainer buyers. For example, if you are a beginner, then you may want to start with the Stamina In-Motion Elliptical Trainer. If you consider yourself an intermediate exerciser, the Sole Fitness E35 and Exerpeutic Aero Air Ellipticals are excellent choices. And if you are an advanced user, the Schwinn 470 should be a very good pick. Regardless of the unit that you eventually buy, I guarantee that you will be able to work out in the comfort of your home with the best elliptical trainer.